This week PolitiFact announced it had created a Kickstarter campaign to raise funds in order to cover the State of the Union address. For those not familiar with Kickstarter, it is an online fundraising site where users present an idea in the hopes of receiving financing. Typically, the creator offers incentives for the backers; e.g., an author seeking funds for a book may offer an autographed copy to backers who pledge a certain amount. While this incentivised system helps make Kickstarter a successful fundraising tool, it also makes it a bad idea for journalism. The flaws with this supposed reward are obvious, both ethically and practically. It's hard to imagine any legitimate journalistic outlet would be willing to explicitly exchange what stories they cover, and what stories they ignore, for a specific price. Not since GOP Congressman "Duke" Cunningham's bribe list was uncovered has an offer to sell influence been so overt. By offering this reward, PolitiFact is openly encouraging the exchange of coverage for a cash gift. If the Koch brothers were to offer to pick up the entire $15,000 tab to cover the State of the Union address, would they be able to put the kibosh on fact checks that may turn out unfavorable to their business? How can a supposedly objective fact checker maintain a shred of credibility once it's offered to sell its services for a price? This brings us to the second problem with the fundraiser: The practical application of the rewards is impossible without performing the Pay to Play scheme described above. As of the time of this writing, the reward to Pick a fact check has five backers. This means in order for the reward to be legitimate, each backer must receive four unique fact checks that PolitiFact is "thinking of working on." Otherwise, unless all five backers selected the same fact check, their selections would cancel the other backers selections out, meaning PolitiFact would end up checking all four items anyway. This would render a backers selection moot, or in other words: worthless. What exactly is PolitiFact offering? If they are in fact offering each backer four unique fact checks to choose from, then it clearly fits the definition of peddling influence and allowing those with cash to sway news coverage both in the affirmative (pick the one to check) and the negative (pick three stories to bury). 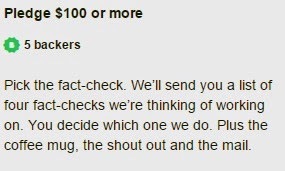 If PolitiFact is offering up the same four fact checks to everyone that pledges $100, then the reward is meaningless because different individuals will select different items to check, meaning all four items will be checked anyway. The reward isn't really a reward at all. It's a promised benefit of the snake oil PolitiFact is hawking. To be sure, we certainly don't begrudge PolitiFact attempting to further monetize their brand. Most journalism projects require revenue, and PolitiFact is no different. (While PFB is a noncommercial site and we fund our insignificant costs personally, Bryan's Zebra Fact Check project provides an opportunity to contribute to his efforts.) However, the idea of allowing someone to influence editorial decisions and cover up specific stories in exchange for cash is something that flies in the face of ethically sound journalism. Depending on which way PolitiFact administers this reward, it's either pulling a scam or soliciting a bribe. We'll add this to the list of poorly conceived decisions under Angie Holan's leadership of the PolitiFact brand. Whatever relevancy PolitiFact had left is now on sale for the low, low price of a crumpled up Benjamin. I almost hope PolitiFact gets 4 billion $100.00 pledges. Update 1/6/2015: We asked PolitiFact to clarify the rewards and we wrote about their response here.